This lovely villa with private pool is next to Mondragó Natural Parc, in the outskirts of S'Alqueria Blanca in Santanyí and is ideal for 6 to 7 people. Have a nap on one of the six loungers, enjoying the Mediterranean sun and relax, maybe having a refreshing exterior shower in between times. Palm trees and lawn areas characterize the nice garden. Later on you can swim in the 10m x 5m private chlorine pool with a depth of 1.7m. Depending on the season you can harvest plums and almonds in the garden. Enjoy a family barbecue on the porch, listening to the cicadas. This dapper villa is completely private and there are no direct neighbours. This house offers accommodation on two floors, comprising a sitting room with satellite-TV, a dining room with open fully-equipped kitchen, a bath with bathtub, a bedroom with double bed and a bedroom with two twin beds on the ground floor. The washing machine, the iron and the ironing board can be find in the kitchen, which has access to the porch. The first storey consist in a bedroom with three single beds, a second bathroom with shower and a non-furnished terrace. All bedrooms have a wardrobe, and two of them are equipped with A/C. Two electric radiators are available. If you come with your baby, we gladly supply one cot and one high chair. 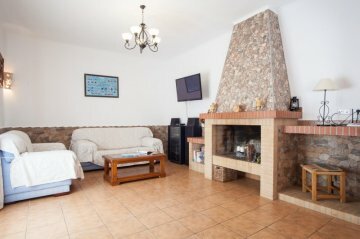 This friendly house is next to the Natural Parc of Mondragó, a lovely area to have a stroll or spend a day on the sand beaches. The harbour of Portopetro is just 2.5 km from the house, offering grocery shops, bars and restaurants. By car you can explore the beautiful beaches, Es Trenc, Cala Santanyí and Cala D'Or. The latter is famous for its nightlife. Palma de Mallorca, the capital's island, is just 55 km away.Note: We cannot accept guests under 25 years unless they are accompanied by their parents. We need copies of the passports of all guests in order to accept the booking.Pets are not allowed. The holding of events is forbidden. Consult the advertiser for possible charges. There is exterior parking for 2 cars. There is covered parking for 2 cars.2019: During June, July, August and September, the changeover day is Saturday.Air-conditioning works from 10 pm to 7 am.Distances: Beach: 3 km - Es Caló des Borgit, PortopetroAirport: 50.4 km - Son Sant Joan, PalmaGolf course: 13 km - Vall d'Or Golf, S'HortaTown: 2.5 km - PortopetroTrain station: 34.6 km - Plaça de l'Estació, ManacorBus stop: 2.5 km - Passeig des Port, PortopetroFerry: 60.9 km - Port de PalmaHospital: 36.3 km - Hospital de ManacorTourist license: 694/ETThere's a mandatory tourist tax in Balearic Islands, called Ecotasa. All guests, except people under 16 years, have to pay this tax. The amount varies between 0.55€/night and guest during the low season and 2.2€/night and guest during the high season and is reduced by half from the 9th day for your stay. Guests will receive an email 7 days prior to arrival with mandatory general deposit payment information. The deposit is payable by credit card via a secure link within 24 hours after receiving the email. For more details, please contact the office using the information on the reservation confirmation received after booking.